* Commentary with writer/director Richard Rush, and stars Peter O’Toole, Steve Railsback, Barbara Hershey, Alex Rocco, Sharon Farrell, and Chuck Bail. People who make movies be crazy, y’all. Actors: Peter O’Toole, Steve Railsback, Barbara Hershey, Alex Rocco. Cameron (Steve Railsback) is a troubled Vietnam vet on the run from the law. While evading the cops he accidentally causes a fancy vintage car to careen off a lonely bridge, only to discover that he’s wandered into the middle of movie scene and bungled an important stunt. Burt, the stuntman who had been driving the car, is now dead, but rather than shut down production the film’s director Eli Cross (Peter O’Toole) decides to hire Cameron to take Burt’s place. Cameron finds himself sucked up in the unique madness of a film shoot, including an unexpected “show-mance” with the leading lady, Nina Franklin (Barbara Hershey). As the production is winding down, Cameron is faced with two stressful problems: 1) what will he do once Eli isn’t hiding him from the cops, and 2) is Eli planning to get him killed while shooting the film, just to capture the “stunt” on camera? $50 says O'Toole was shitfaced in this shot. 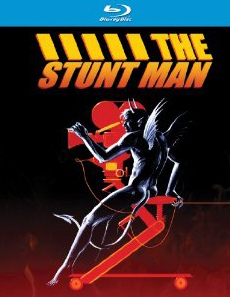 The Stunt Man is a bizarre, provocative, and pretty amazing film. Greatly loved within ‘the Biz’ back in its time, the film has fallen from general public awareness in the ensuing decades. The same unfortunate fate can be said for its mastermind, Richard Rush. After a string of fairly successful b-movies in the 60’s, Rush only made two films in the 70’s, but both films found admires in the industry in very high places. Ingmar Bergman called Rush’s 1970 Elliot Gould dramedy, Getting Straight, the best American film of the decade. While Stanley Kubrick said that 1974’s proto-buddy cop comedy Freebie and the Bean was his favorite movie of the year. So beloved by mad genius directors, it only made sense for a mad genius like Rush to turn his darkly comic eye inwards for a tale about Hollywood itself. Rush received Oscar noms for Best Director and Best Adapted Screenplay for The Stunt Man, then didn’t direct another film for fourteen years until inexplicably helming the Bruce Willis softcore thriller Color of Night. Well, hopefully this fantastic blu-ray can help both The Stunt Man and Rush slowly rise back to their rightful place in our collective memory. The Stunt Man unspools in an almost dreamlike fashion that comes dangerously close to being sloppy at times. But it never slips over that edge. So what Rush leaves us feels raw and unpredictable, perilous, almost threatening at times. This sensation is most embodied by our “hero,” Cameron. I mean, Rush cast Steve Railsback; that says something in itself about the character. The man has played both Charles Manson and Ed Gein, not to mention nervous weirdos on both The X-Files and Supernatural. If you try to view The Stunt Man as a typical film, Railsback may feel miscast. How can you get involved as a viewer in a love story involving this jittery creep and the painfully stunning Barbara Hershey? And why are the cops after Cameron? Should we root for this guy at all? He seems like he has some anger issues. But you shouldn’t view The Stunt Man as a typical film. Rush presents a film shoot as a place of bedlam, where life and love and the law may be cheap, and everything and everyone exists just to get the film in the can. The Rush that directed The Stunt Man can be seen as sort of an American Fellini here, as the film has a baroque nightmare quality to it. Nothing feels quite real — from the tone of that initial accident, to the surprising action climax. The movie spans mere days, but things happen so fast for Cameron. And as the film progresses, Cameron finds himself at the center of a Hitchcockian ‘wrong man’ tale. Railsback was never cut out to be a leading man, but he serves Cameron well. Hershey, aside from being, as I said, painfully stunning here, gives a pitch perfect performance as a flighty and quick to love movie star (possibly not that far off from the real Hershey). But the molten, white-hot center of this film is Peter O’Toole. I haven’t seen all of O’Toole’s films, but I’d nonetheless place his greatest performances as those in Lawrence of Arabia, The Lion in Winter, The Ruling Class, My Favorite Year, and this, The Stunt Man. It’s frankly ridiculous that O’Toole has never won as Oscar for Best Actor, although he did have some stiff competition for a few of his eight nominations — there was simply no way he was going to win for The Stunt Man over Robert DeNiro in Raging Bull; just wasn’t going to happen. O’Toole crackles as Eli Cross; a performance he says he based on Lawrence director David Lean. What really works about Cross is that Rush presents the character as so over-the-top that O’Toole doesn’t need to play it that way. Cross has an amazing character introduction. 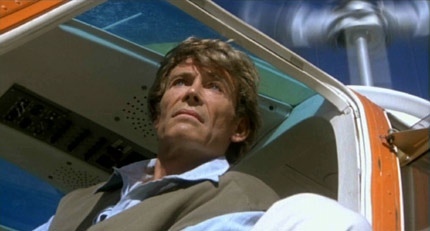 After briefly seeing him in a helicopter during the sequence where Cameron accidentally gets Burt the stuntman killed, Cross remains absent from the film for a short while. Then he makes a grandiose entrance in a helicopter, descending upon us like some demigod. This aura of godly power is strung by Rush throughout the film, both thematically in the story but also aesthetically through the visuals — most notably (and awesomely) with the camera crane-mount that Cross loves to ride around in on the set. Logically speaking, it doesn’t make tons of sense. Who is controlling this chair, which dangles from the end of a cable attached to a crane high above, as Cross “walks” and talks with Cameron around the set. It doesn’t matter though, because it is so instantly iconic. Cross floats through the set, rising and descending from above as he sees fit, almost as if he were controlling the crane with his mind. You believe this man can and will do anything for his movie. If The Stunt Man was your only source of information on how a movie was shot, you would have an extremely poor grasp of how it is done. But The Stunt Man isn’t trying to give you a realistic slice-of-life presentation of moviemaking. Extremely complicated, lenghty multi-character action sequences are improbably shot in single takes, and the climax and resolution are utterly preposterous, at pretty much every turn. I could understand some not enjoying the taste of cheese Rush slathers over a lot of the film, especially the ending, but I think it all works. If nothing else, the film is worth seeing just for O’Toole. Now why would somebody toss out a perfectly good Barbara Hershey like this? The film itself looks and sounds great, but the biggest win of this blu is the host of special features. Some of the material has been carried over from the previous DVD release, but all the interviews are new, as is the featurette on Rush’s career. Considering how old O’Toole is, and how much alcohol the man has consumed in his life, O’Toole’s mind is still sharp as ever and he’s got some great stories. But by far the most interesting featurette on this disc is the feature-length documentary The Sinister Saga Of The Making Of The Stunt Man. Created by Rush himself, the doc has been available in its own DVD previously, though I’d never seen it before. Aside from being legitimately informative and including some deleted scenes, Rush decided to shoot and edit the entire thing in as weird a fashion as he possibly could. You can practically taste how much fun he was having making the damned thing — after all, he has hardly done any directing in the past three decades, so he must have been bursting with enthusiasm. A great film with a great disc.